Water Storage or no water storage- what is the best way to go with installing a wood boiler? This is the million dollar question, in my my humble opinion water storage is the best way to go, if you can make it happen. Let me explain it the way the Europeans view effcient hot water solid fuel boilers. Picture this, you have a gallon of fuel and you have a generator. You need to produce eletricity to power your home. Running a large generator at an idle all day long does not make a gallon of fuel go very far, but run the generator at a more efficient speed and use that power to charge your battery bank. You can then draw a little power as needed later and the generator does not need to run except to charge the battery bank again. Depending on how frugal you are with your stored energy, will determin how long you can go on a charge. Now picture that same generator as your new high tech gasifiaction boiler hooked to a set of storage tanks that are designed to store the BTU’s produced when the boiler is fired up as needed. What are the benefits you ask? Lots! Once again once you’ve experienced it, you wonder why you would ever do it any other way……..now you only need to run the boiler when needed, if the weather is mild, you pull less BTUs from your storage tanks and they stay hotter longer. So in mild weather you may only fire the boiler once a week when the tank temps drop below a certain temp, which triggers a flashing light somewhere that lets someone know its time to fire the boiler. In extreme cold you may have to fire the boiler every other day. The boiler runs at an optimal computer controlled combustion, the best and most effeceint of these employ Labada Technolgy which also montiers the CO output. This all basicly translates into per pound of wood fed to the boiler, you are getting over 90% back in usable BTUs. That means less wood hauled, split, stacked seasoned……..and feed to the boiler. If you are buying your wood, that really adds up fast. Letting any solid fuel boiler idle for days is a very inefficient use of the wood, even a high efficiency gasification boiler does not retain that efficiency at idle. 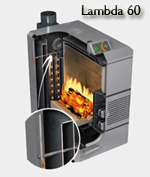 All boilers burn best at optimal temperatures. 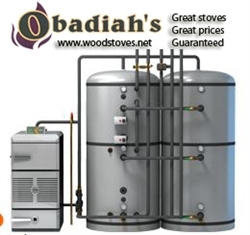 It is a good idea to have water storage for any boiler installation, because the same principle exsist in all solid fuel appliances - you can not shut the fire down once started as you can with gas or oil by turning on and off a valve to control the flow of fuel. Once the wood is lit it takes a while to achieve good combustion temps. It is not good to stop, or interupt the process once it has begun. 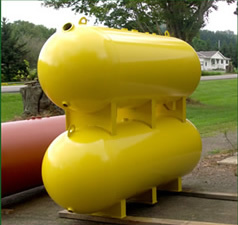 It is best to burn hot and store the energy in as large of tanks as your installation BTU demands dictate. It is best to do an energy audit and figure out the BTU load in the worst of weather. Then you can figure how many BTUs you should be able to store to last you between fires. We had a customer that was an over the road trucker who was home every other week. He loved it that he could go 9 days in the coldest of weather before having to fire his boiler, so his wife did not have to bother with it at all. Installing your tank inside the home in the basement puts all those BTUs that do bleed off, inside the structure that you are heating, so there is little heat loss. Next comes choosing a good gasification boiler. Today in North America you have far more choices than you did just 10 yrs ago. Pioneers like Craig Issod of www.hearth.comsaw the handwriting on the wall and began importing the HS Tarm line of boilers way back when. These were cutting edge technology back then and there were few competitiors. Others soon followed and now you also have many options to pick from in European gasification boilers. Polish imports like EKO and BioMass offer a big bang for the buck. 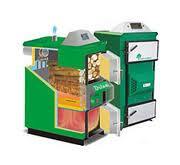 The new Effecta boiler is a Swedish built contender utilizing Lambda Technolgy. The Vigas has gained populairty particularly back east. 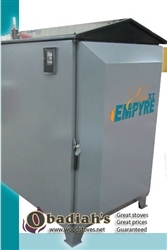 If you want to stay North American made, the Pro Fab Empyre Elite series offers a great value for the price. 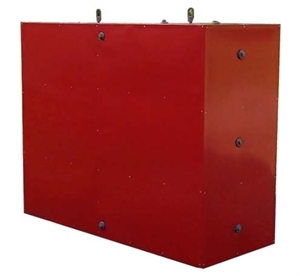 The Woodmaster Flex Fuel Boiler is a state of the art US/German venture that is awesome and also utilizes Lambda Technolgy. Whichever model boiler you go with, pick your dealer wisely. Great deals can be found online, but what happens when there are problems down the road. If your dealer won’t support you, you could be in a pickle. Also make sure you have a good installer who is familiar with installing boilers and has lots of happy customers. If you are capable of doing the installation yourself, review your local codes, so you understand all the requirements to do the installation properly. If your dealer does not know as much as you, maybe you better find a different dealer. 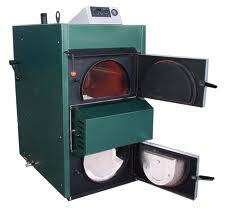 Boilers are not something to play with if your not sure exactly what you are doing. Find a licenced professional to help you do the installation properly.